"Sprites are described as flashes high in the atmosphere, between 35 and 80 miles from the ground, much higher than the 7 to 10 miles where regular lightning bolts usually occur." So how exactly could this be a possible UFO sighting explanation if these 'sprite' events are happening so high up above the cloud cover? These 'sprites' would not be visible from ground level. Also, these 'sprites' have been known about for quite a few years now and have since not offered very good evidence of a plausible explanation for UFO sightings. 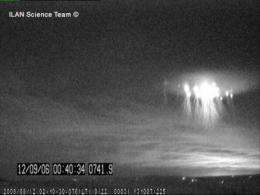 "Sprites, which only occur in conjunction with thunderstorms, never occur on their own..."
How many UFO sighting photographs/witness accounts have you seen/heard about that occur in thunderstorms and are actually taken seriously? There is a reason for this. The reference this article makes in regards to a possible UFO sightings explanation is unfounded and simply ridiculous. Not to mention these are quick brilliant flashes, not a group of "stationary hovering lights" as is usually reported. I have seen a UFO, the typical kind reported with lights and changes in direction and speed, also observed by 1000's of other people. It was not a sprite. Clear weather, great visibility. Considering the curvature of the Earth, sprites from a thunderstorm 500 to 800 miles away would appear right on the horizon and the thunderstorm itself would not be visible. Thus the statements by both Tangent2 and Bob_b implying that sprites can't explain fair-weather UFO sightings are misguided. Earls's "quick brilliant flashes" statement also ignores persistence of vision as might occur with a bright flash occurring in dim lighting. In fact persistence of vision induced by sprites plus eye microsaccades might explain certain reports of UFOs flying at amazing speeds and making quick, "physically impossible," turns. I'm not saying that sprites are the source of all or even most UFO sightings, but the current commenters seem to have ruled out the possibility for less than well-thought-out reasons. Electric universe has an interesting article on how a sprite might have been responsible for the space shuttle columbia disaster. "they are high in the sky and last for only a fraction of a second." If sprites can last only for fraction of seconds, that clearly says that they cannot be mistaken for UFOs. Because people see the UFOs for longer and sometimes even take a picture of them. I haven't seen UFO and don't make any claims here. But the logic of the article is flawed.